Pedal along Athens’ coastline on this half-day tour by electric bike. Meet your guide in the city center, then pull on your helmet and set off at a leisurely pace. Cycle along a dedicated cycle lane, you’ll cruise through the city to the coastline. Hop off at the region’s prettiest marinas, including Flisvos, where the rich and famous moor their yachts, and Microlimano. This small-group tour is limited to just 10 people. 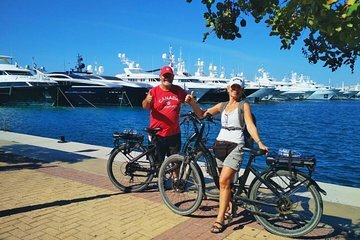 Enjoy a leisurely paced cycle ride through Athens and along the Grecian coast with this 4-hour bike tour. Make short work of the cycling with your bike’s electric motor, and benefit from your guide’s personal attention on this small-group tour. Great fun on those electric bikes!